Pork shoulder roast is amazing because it is so inexpensive but yields delicious porky goodness. This is definitely a winner anytime since it is really hard to mess this up. To begin I rubbed the pork in a combination of brown sugar, garlic and crushed pistachios. I let the pork sit with the rub for a couple of hours before placing in the slow cooker. 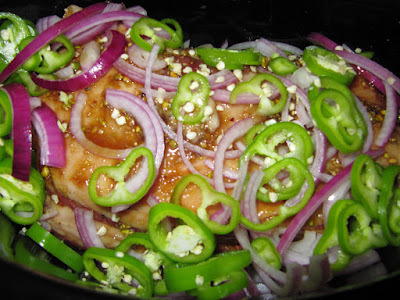 I added sliced red onions, anaheim chiles, and beer to the slow cooker and set to cook on low for 7 hours. I moved the roast and some of the chiles from the slow cooker to a very hot oven. I blasted the pork roast to crisp up the outside to achieve a texture somewhat similar to carnitas. I reduced the leftover cooking liquid, added apple cider vinegar, garlic, paprika, red pepper flakes, and mustard to create a quick barbecue sauce. 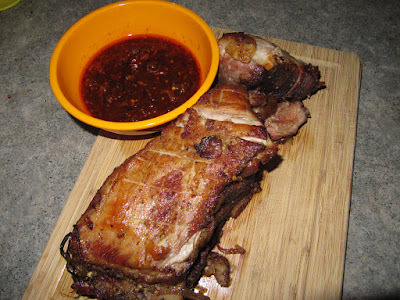 The pork was delicious and luscious, the sauce added a bit of spice and sweetness to really bring out the flavor. This looks really fantastic. Would you mind sharing how you used the oven to achieve the crispiness? I preheated the oven to 450, in the meantime I cut small slits on the portions of exposed skin and fat. I then threw the pork in the oven and cooked for about 30min, making sure not to burn anything. Great blog by the way, what are your thoughts on Three Floyd's? Great, thanks for the tip. I think I'm going to have to give this a try over the weekend. I haven't ever had a chance to try Three Floyd's. I poked around their website a bit and it doesn't look like they distribute to California, although I'll keep my eyes peeled at the beer store. Is it pretty good stuff? the BBQ sauce looks AMAZING (i think mustard is critical to a good one!). and what kind of slow cooker are you using? i wonder if i could simulate this in my rice cooker (which actually cooks lots of things besides rice - i make kalbi jjim in there sometimes and it's a similar slow-cooking process for tenderizing tough/stringy beef). Daniel, this looks redic. We're definitely going to try this at home. Silly question, how did you reduce the left over liquid. Just pour it into a sauce pan and slowly heat? Did you use a solvent (like brandy or vinegar) to get some of the leftovers off the pan? I was always terrible at doing au poivre. megan, hmmm not too sure, but I do use the rice cooker for other things as well! I would imagine if you can slow cook beef, you can do pork. It would make for an interesting experiment! Actually I did this in the slow cooker so I just dumped all the cooking liquid into a saucepan afterwards, but I did add vinegar and mustard. Since it is braising there aren't any tasty bits that stick to the pan.